“Merle Haggard is a hell of a storyteller,” says Suzy. “When I hear his songs, I feel like I’m listening in on someone’s life.” On her new album, Lucky, a collection of songs all written by Haggard, Suzy does more than just listen—the CMA, ACM and Grammy Award-winning singer makes the country rebel’s compositions her own, reinterpreting classics like 'The Bottle Let Me Down', 'Silver Wings' and 'Today I Started Loving You Again' from a female point of view. 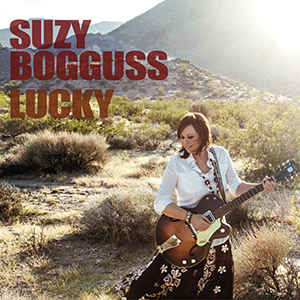 Turns out, a woman can—especially if that woman is Suzy Bogguss, one of country music’s most pristine and evocative vocalists. With the release of the Illinois native’s 1989 major label debut, Somewhere Between, Suzy quickly became one of the key artists that defined those golden days of ’90s country. She scored a string of Top 10 singles with country radio staples like 'Outbound Plane', 'Drive South', 'Hey Cinderella', 'Letting Go' and 'Aces', and her 1991 album of that name was certified platinum. In addition, she scored a trio of gold albums and notched more than 3 million sales. With Lucky, released on Proper Records, the singer comes full circle, returning yet again to her early inspiration, Haggard—Suzy’s Somewhere Between was titled after a Hag cut. “I don’t want it to be viewed that way. I had been wanting to make a record based in country and blues and I just kept thinking of great Haggard songs,” Suzy says. “Finally it just made sense to quit denying that what I really wanted was to sing an entire album of Merle songs! I have always looked to great singer/songwriters for material outside of my own. These songs are perfect for me at this time in my life. They just happen to all be written by one guy." Lucky is remarkable in its freshness. Its acoustic-based arrangements, while sparse, crackle with vibrancy. Each song is driven by the perfect marriage of Suzy’s delicate voice and the adventurous, yet tasteful, playing of the band. It’s indicative of what Haggard himself would do in the studio. Suzy followed suit. Assembling her own ace band at her home studio—along with an A-team of singer-songwriters, including Jessi Alexander, Matraca Berg, Beth Nielsen Chapman, Gretchen Peters and Jon Randall Stewart, to lend background vocals—she cut a dozen Haggard tunes. They range from the boozy lament 'I Think I’ll Just Stay Here and Drink' and the randy 'Let’s Chase Each Other Round the Room' to the somber one-two punch of 'You Don’t Have Very Far to Go' and 'Someday When Things Are Good'. “Merle’s songs were on the 8-track player in my dad’s car. Saturday nights when I would drive around with my friends, this was a part of our soundtrack. Back when country music talked about real adult problems and how we deal with them. We felt like we were eavesdropping on the secret lives of our parents,” Suzy says. “Merle’s songs feel familiar... and slightly dangerous. And there’s not a truck or a bonfire in the batch." “What I really wanted to illuminate is not only is this guy awesome to see live and awesome to listen to on his records, but his songs are very relatable for somebody else to communicate to other people,” Suzy says. “Not every artist has music that is as universal as Merle’s. It’s pretty heavy-duty stuff and I think that’s why to so many of us who sing and write songs, he’s such a king among us." Or in this case, an extraordinary woman.